One of the most exciting, yet little-known events of this century was the formation of several highly intriguing crop circles near the U.K.'s Chilbolton Observatory. One of these crop circles, formed in August 2001, was later decoded revealing what appears to be a fascinating message to humanity. Before reading on, click below to watch a mind-expanding, six-minute video clip from the documentary Crop Circles: Crossover from Another Dimension, which shows the beautiful complexity and gives an excellent explanation of the Chilbolton crop circles and their decoded messages. Though some crop circles are artificially created, the sheer volume and the incredible sophistication and size of some suggest that it would be nearly impossible for even a group of people to create them in the course of one night. And for undeniable evidence of the existence of intelligent extraterrestrial life, watch the amazing UFO footage in the Sci-Fi Channel's Out of the Blue. This profound documentary includes riveting personal testimony from a number of astronauts, generals, and top politicians on their involvement in a major cover-up of the extraterrestrial phenomenon. As described in the crop circle video at the link above, the most exciting of the Chilbolton crop circle messages turned out on decoding to be a clear response to the 1974 message from humanity sent into outer space. Sent to other potential denizens of our universe through the the world's largest radio telescope in Arecibo, Puerto Rico, the original message was crafted by Carl Sagan, Dr. Frank Drake, and others. A detailed image of this transmission, with complete description, may be found on page 290 of Sagan's 1980 book Cosmos. 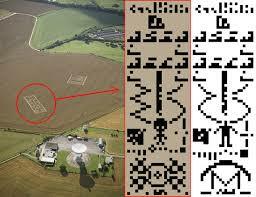 From the aerial view [the image in the crop circle] is the shape of an ET figure. It clearly has a little stick-like body with two arms and two legs, but has a much larger head and two distinct eyes. If you decode the 'population' binary sequence in the actual crop formation you get a value of approx 21.3 billion. There is also some indication of a change in the basic DNA structure of ET. The additional (third) strand shown on the left and also a change in the number of nucleotides indicates a different DNA than ours. The above excerpt is taken from a thorough analysis with detailed photos and description of this most amazing crop circle message and how it was decoded on this webpage. This page and the above video clip are well worth exploring if you are at all intrigued by this amazing message which appears to be from another race of intelligent beings who share our universe. Crop circles are but one of many highly intriguing phenomena which are difficult to explain away. Could some of these be messages informing those with eyes to see that we are not alone in the universe? The question of extraterrestrial life continues to be one of the most baffling and profound questions about life in our universe. For those with an open mind, exploring these crop circles and the reliable resources listed in the "What you can do" section below may open you to exciting new vistas on the meaning of life for us individually and for all of humanity. Have fun exploring! Note: Read an intriguing essay on the pair of Chilbolton crop circles which formed one year after the Arecibo message was received. Explore several other excellent UFO documentaries which present undeniable evidence that we are not alone in this universe. And check out a 17-second video purportedly capturing a crop circle being made by balls of light. Contact your media and political representatives to inform them of this vital information on the fascinating decoded messages of these crop circles. Urge them to study and bring publicity to this important topic. Invite them to read this article and explore the links included. Spread this news on the fascinating decoded messages of these crop circles to your friends and colleagues, and bookmark this article on key social networking websites using the "Share" icon on this page, so that we can fill the role at which the major media is sadly failing. Together, we can make a difference.